I used to have one of those automatic signatures set up on our email. It said, “From the house of fur balls and cat naps.” and then it would be followed by our names. I am sure that I have plenty of photos of “cat naps” and other assorted cat activities, but it seems there is always room for more. Someone is enjoying MY chair! Each cat definitely has some favorite spots. This spot is a new one for Tiger Tail and I know why. We have had a stray male cat that has been hanging around for the past few months. His presence is causing a lot of disruption in our cats. Our older male cat, Kivuli, seems to tolerate it on one level, I think mainly because he is slowing down and isn’t as territorial as he once was. He doesn’t roam and guard on even a fraction of the level he used to. Then on the other hand he isn’t thrilled about it either. It is interesting to watch that dynamic change when he was very territorial and a fierce fighter in his day. Tiger Tail however gets very stressed when there are other cats around. She breaks out with cat acne on her chin and in our old house she had started spraying inside. That is not a fun situation at all and I do not want that to start happening here. 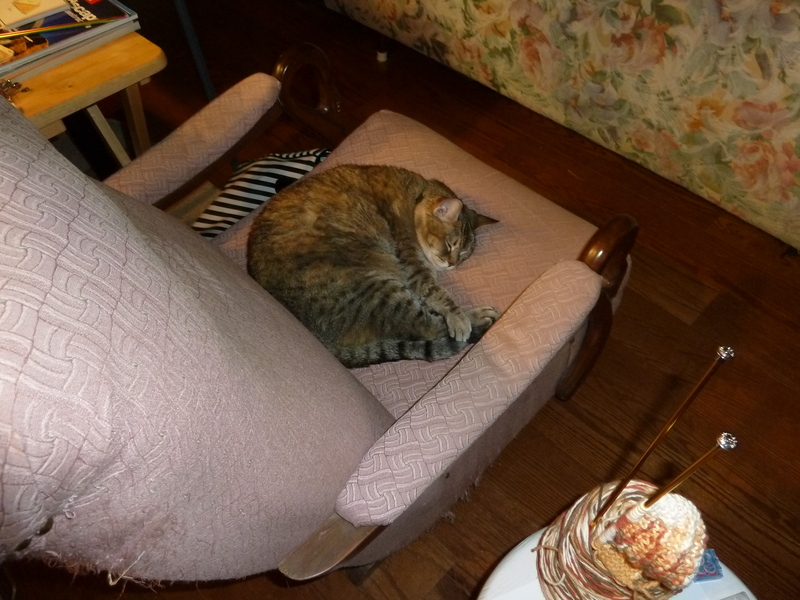 Tiger Tail has taken up this spot in my chair because it has a clear view out the back door and through the screen porch and out into the yard. She is keeping an eye out for the other cat. Cinder and Tiger Tail have not been real active since we moved to Texas three years ago, rarely going outside. I have noticed, that even though they are not the best of pals, they do go outside together from time to time, acting like a team and keeping watch. Unfortunately Tiger Tail encountered our visiting cat on her own the other day and it ended in a fight. That was her first cat fight (she is 10), and thankfully she came out alright. Kivuli has had a few rounds with him and for the most part came out alright too. I know they are all testing each other. 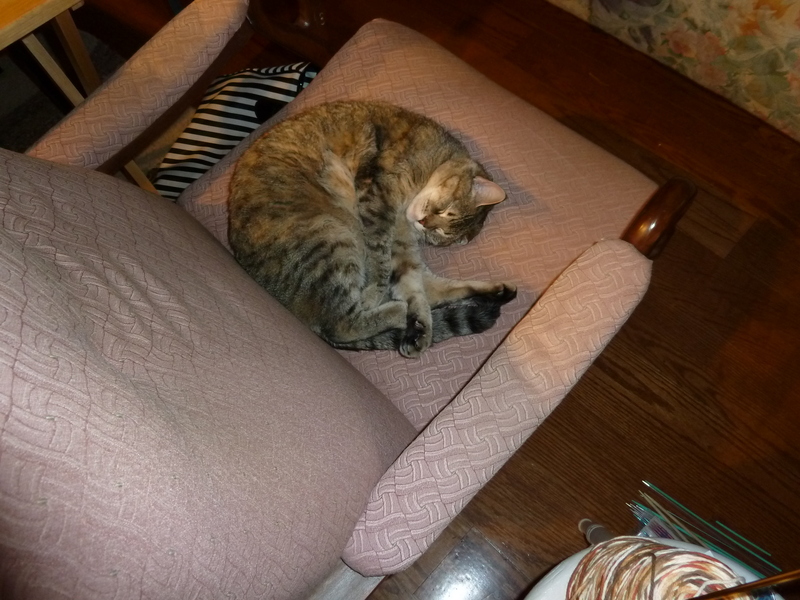 So for now, I will relinquish my chair for Tiger Tail when she wants it. There are other chairs I can use. It’s funny how we react to our pets. If Gellie is in my arms or sleeping near me, I won’t move because I don’t want to disturb him. You gave up your chair. I miss having a cat they are so interesting! They are always so entertaining.